Back to Middle East Intelligence Bulletin homepage. Jamil al-Sayyid, the director-general of Lebanon's Sureté Générale (General Security Directorate), is widely considered to be the most powerful (Lebanese) political figure in Lebanon. Working in conjunction with the head of Syrian intelligence in Lebanon, Maj. Gen. Ghazi Kanaan, Sayyid is directly or indirectly responsible for most illegal arrests and "disappearances" that take place in the country. Sayyid, 58, was born in the village of al-Nabi Eila, near Ablah, in the Bekaa valley. After graduating from the al-Hikmeh school in Beirut he joined the Lebanese army and served in the armored corps. He was stationed in Beirut until March 1976 when he joined the First Brigade in the Bekaa valley, headed by Brigadier General Ibrahim Shaheen, who at that time established the "Vanguards Of The Arab Lebanese Army" under Syrian supervision. In 1977, Sayyid took charge of the intelligence branch of the First Brigade after it was reincorporated into the Lebanese army. 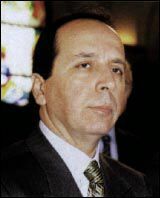 In 1982, Sayyid became deputy chief of the Lebanese Intelligence Services in the Bekaa valley under Colonel Michel Rahbani. Later that year he traveled to Arizona and attended a four-month military intelligence course under the IMET program. In 1984, Sayyid became the chief intelligence officer in the Bekaa valley after Rahbani was transferred to Beirut. In 1989-1990, Sayyid was in charge of security for the Syrian-appointed Lebanese president, Elias Hrawi, in the Bekaa valley and later at his temporary residence in West Beirut. Between 1990 and 1992, Sayyid played a key role in reorganizing the army's intelligence services under close Syrian supervision. In 1992, Sayyid was appointed deputy chief of military intelligence (again under Rahbani). In December 1998, newly-selected Lebanese president Emile Lahoud named Sayyid the director-general of the Sureté Générale. The military records of the Lebanese army indicate that Sayyid is smart and smooth but has a tendency to blink under pressure. He acted as a double agent for Syria and the Lebanese army until 1983, when his car was ambushed near his village. Although his driver was killed instantly, Sayyid escaped the assassination attempt miraculously. Some claim that Syria was behind the assassination attempt on his life, while others insist that Hezbollah and/or the Iranian Revolutionary Guards were behind it. In any case, terrorized by this narrow escape, Sayyid decided to collaborate fully with the Syrians. Kanaan brought him under his wing and provided a team of Syrian bodyguards to protect him. Sayyid has a style of providing little information to one side in order to extract more valuable information for the other side. The Syrians had him play this role vis-à-vis the Lebanese government in the 1980's and, during the 1990's, with Western intelligence services. The rapid advancement of his career testifies to his dedicated service on behalf of the Syrians. During his tenure as deputy chief of the military intelligence, Sayyid played an unofficial role as "campaign manager" for Emile Lahoud, the Lebanese Army Commander, to become the next president of Lebanon. His task was twofold: to intimidate and politically neutralize Lahoud's political opponents and to monitor his behavior on behalf of the Syrians. In his capacity as informant for Damascus, Sayyid accused the would-be president of covertly meeting with American intelligence officials several times on board a naval vessel in the Mediterranean Sea. This led to a large-scale Syrian investigation of Lahoud, who has deeply mistrusted Sayyid ever since. Lahoud's relationship with Sayyid deteriorated even further after he assumed his new job as president. In one cabinet meeting, Lahoud reportedly rebuked a minister for merely mentioning Sayyid's name and snapped that "Jamil is just an employee." Lahoud refused to side with Sayyid when the latter tried unsuccessfully to move the phone tapping surveillance equipment he once controlled at the army's intelligence center to his new post at the Surete Generale. Raymond Azar, the newly-appointed army intelligence chief, convinced the Syrians and Lahoud that it was unnecessary to move the surveillance equipment since all the intelligence services are eventually reporting to the same source. Sayyid threatened to resign and secluded himself at home for several days, returning to work the following Monday only under direct pressure from Kanaan. As a result of his rivalry with Lahoud, Sayyid has begun a rapprochement with former Prime Minister Rafiq Hariri, a longtime opponent of the Lebanese president. Sources around Lahoud accused Sayyid of taking financial support from Hariri all along and questions were raised about his luxurious apartments near the Summerland resort in Beirut and his four million- dollar mansion in his hometown village. Sayyid regained most of the political ground he had lost by the spring of 1999, when Kanaan began to clip the wings of Lahoud and vigorously support Sayyid. Kanaan, it is said, learned that Lahoud had secretly suggested to Syrian leader Hafez Assad that he be replaced as head of Syrian Intelligence in Lebanon by Assad's son-in-law, Assef Shawkat. In a country where even the Syrians often find themselves double-crossed by their allies, Sayyid is distinguished by loyalty to his master. Presently, Sayyid's assignment is to cross-examine potential candidates for the next cabinet and parliament. Sayyid plans to run for parliament in 2004 and is being groomed to become speaker of the parliament shortly thereafter. He is related by marriage to Mustafa Hamdan, the commander of the Lebanese Presidential Guards. � 2000 Middle East Intelligence Bulletin. All rights reserved.